January 31, 2017 By This post may contain affiliate links. Cut into this chocolate covered nougat bar to reveal brilliantly colored layers of red, orange, yellow, green, blue, indigo, and purple. 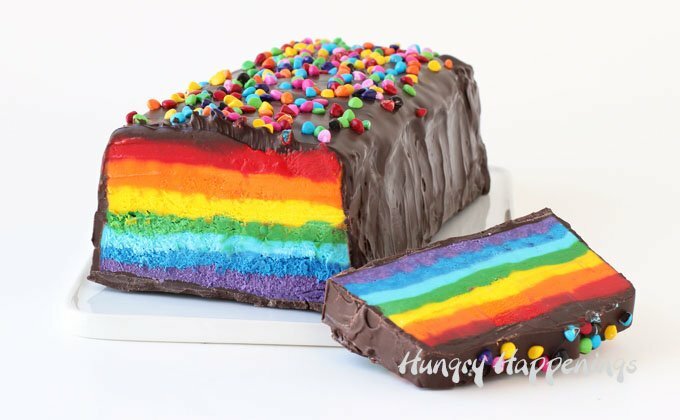 This Giant Rainbow Candy Bar will brighten anyone’s day. It’s that time of year when cookies, cupcakes, cakes and treats are turned into Rainbows. 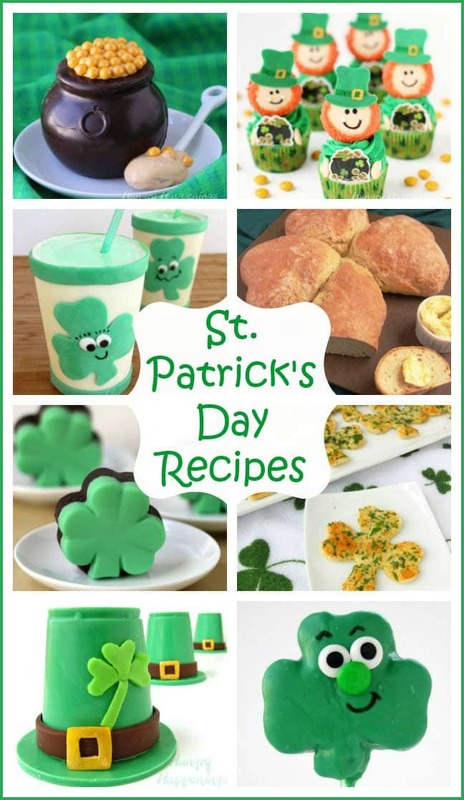 Lots of rainbow treats are made for St. Patrick’s Day, but I think more are made in February and March just because people are tired of gloomy grey skies and they want to see some color. I know I sure do. Over the years I have made my own share of rainbow themed desserts and even a rainbow appetizer, but this was my first experience making a rainbow candy bar. For the center of the candy bar I used a quick and easy 2-ingredient nougat. You simply blend marshmallow creme (fluff) into white chocolate, or in this case, colored Candy Melts. It couldn’t be easier. Being the white marshmallow mellowed out the color more than I liked, I added some food coloring to make sure my rainbow was vibrantly colored. 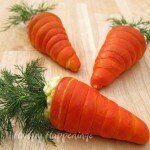 Typically when coloring white chocolate or Candy Melts (confectionery coating) you want to be sure to use special oil based candy coloring. 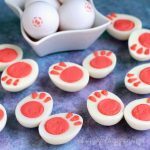 In this instance, however, once the marshmallow is blended with the candy it’s alright to use a water based icing coloring. If you have candy coloring, go ahead and use it, but if you don’t then don’t invest in the coloring just for this project. You will need red, orange, yellow, green, light blue, indigo (navy or royal blue), and purple coloring in addition to the same colors of Candy Melts. You could, if you prefer, use bright white Candy Melts, and color it, but I find it difficult to get a nice vibrant red and green using this method. I have to warn you that this candy bar is super sweet. If you are like me and you enjoy snacking on a bowl of frosting then you will love this treat. If you find spoonfuls of frosting overwhelmingly sweet then you might want to cut this bar in half and make two candy bars out of it, so the ratio of dark chocolate to the sweet marshmallow nougat is more balanced. 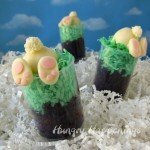 This candy bar would make a great alternative to a birthday cake or a perfect treat to serve at a St. Patrick’s Day party. It’s so colorful and fun that it will brighten up anyone’s day, so it would also be great to bring to a sick friend or just someone who is feeling a bit blue. To cut the bar, heat a knife over a flame so that the knife will melt the outer chocolate shell. Just be careful you don’t touch the hot knife blade while you are cutting your rainbow candy bar. The process of making this bar is not challenging at all, but it is a bit time consuming, so be sure to give yourself about an hour to get this done. 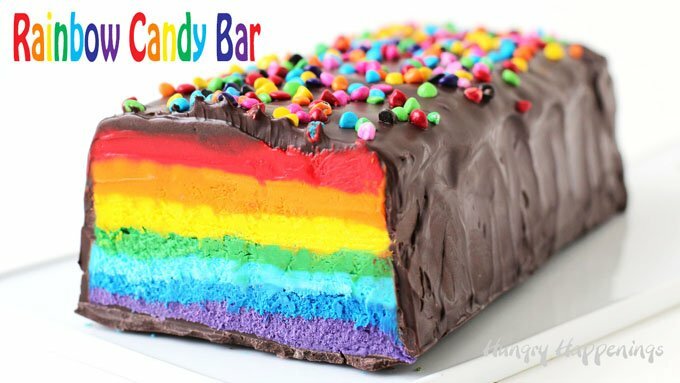 The recipe is below, but here’s a video tutorial so that you can see how to make your own Giant Rainbow Candy Bar. 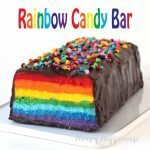 You can find all the items you need to make your own Giant Rainbow Candy Bar from Amazon (commission earned for sales). Layers of rainbow colored marshmallow nougat covered in dark chocolate. Heat red candy melts in microwave on high power for 30 seconds then stir. Heat another 30 seconds then stir. Heat for 20 seconds then let sit in microwave for 2 minutes before stirring. If not all melted, let sit for another 2 minutes then stir again. If needed, heat for 10 second increments stirring after each until melted. It's best to keep the candy from getting over 95 degrees F.
If the candy got really hot, let it cool, stirring often, until just warm. Add the marshmallow creme and stir just until half of it is mixed in then add the food coloring, if using, and continue to stir until well combined. The mixture will become thick quickly. Spread the red nougat into the bottom of a silicone loaf pan or into a metal loaf pan lined with strips of parchment paper. Repeat the process above layering in the orange, yellow, green, blue, indigo, and purple nougat. Set aside for 30 minutes so that the candy firms up. Pour just enough chocolate to cover the top of the purple layer and spread it into an even layer. Tap the mold on the counter a few times to remove any air bubbles. 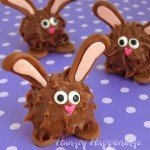 If using pure chocolate refrigerate for 10-15 minutes until the chocolate hardens.If using Candy Melts freeze for about 10 minutes. Set the candy bar up on two glasses that fit underneath. Pour the remaining chocolate over top of the bar allowing it to run down over the sides. Clean up the drips of chocolate from the bottom edge of the bar using a spatula or knife. Chill for 10-15 minutes until the chocolate hardens. 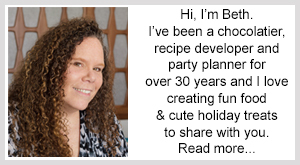 If you don’t have experience melting Candy Melts or melting and tempering pure chocolate, check out the detailed instructions on my Chocolate Making Tips page. Use oil based food coloring if you have it otherwise use icing coloring. Just be sure to mix in some of the marshmallow creme before adding the icing coloring or your candy will seize up (thicken drastically). 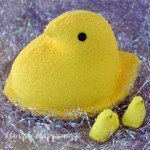 I suggest using a silicone loaf pan for this because it is so easy to get the candy bar out of the mold. If you don’t have one, you can line a metal loaf pan with parchment paper. Be sure to cut one piece of paper to go lengthwise and one to crisscross over going the opposite way. That way you can pull up on all four edges of the paper to remove your candy bar. 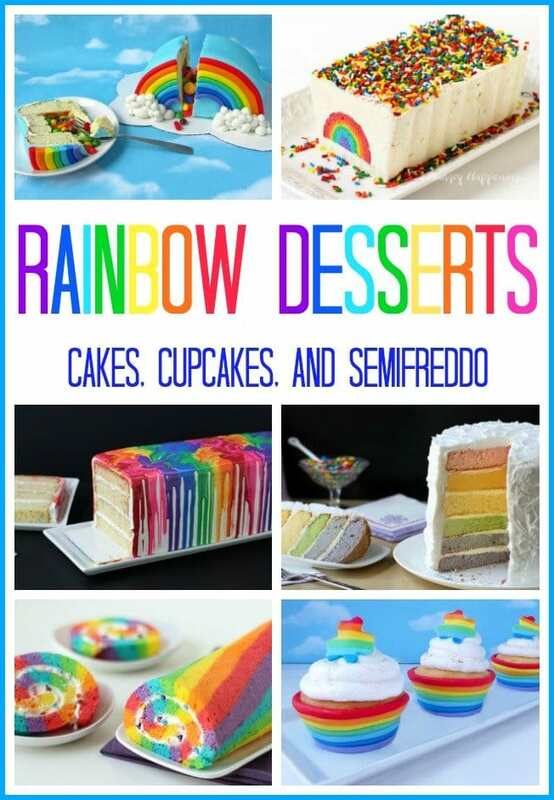 If you love rainbow colored desserts, you might also like to check out these other colorful recipes. I love it! 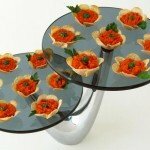 You are so right about needing some color in the midst of the winter blahs! Your candy bar looks yummy and very cheery indeed! Thanks, Karen. This candy bar sure brightened up my day despite the gray skies. Beth, do you know if the rainbow chips are sold in a grocery store? Yes, you can get Betty Crocker Rainbow Chips in the baking aisle at some grocery stores. 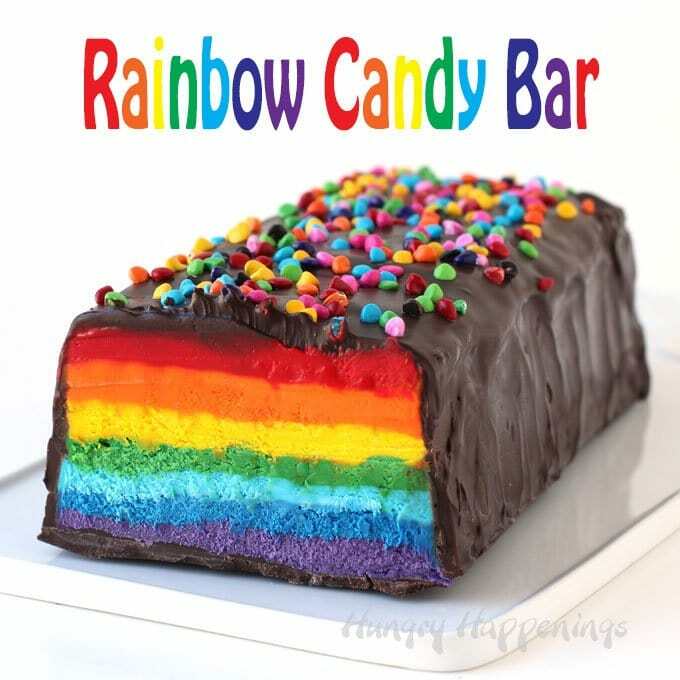 What a fun candy bar to cut into, I can totally taste the rainbow! I just sent this to a group of kids at my friend’s church. I hope they taste the rainbow! LOL! This is brilliant! I never thought of mixing candy melts with marshmallow fluff!